Warner Bros.There are so many pop-culture references in ‘Ready Player One’ I could watch it five more times and not catch them all. With Steven Spielberg at the helm adapting a book that celebrates the geeky decade when he was at his peak, it’s OK to go into “Ready Player One” (in theatres now) with a whole lot of scepticism. Is Spielberg too close to the material to be able to pull off a story that is true to Ernest Cline’s book? No. It’s as simple as that. Spielberg – along with the screenwriter Zak Penn (“X-Men: The Last Stand,” “Last Action Hero”) and Cline (who is also a credited screenwriter) – creates an event film that has to be seen on a big screen to be fully appreciated. Along with the countless pop-culture references (I don’t think I could catch them all even if I saw it five more times), Spielberg dusts off his action-adventure storytelling toolbox to prove to everyone he still can make a blockbuster movie at a high level. For a Spielberg blockbuster that was universally praised, you have to go all the way back to Tom Cruise running from aliens in 2005’s “War of the Worlds.” But I’ll go even further back than that. Personally, I think “Ready Player One” is Spielberg’s most enjoyable movie since 2002’s “Catch Me If You Can” starring Leonardo DiCaprio. If you’re not familiar with the book, Wade Watts (played by Tye Sheridan) lives in the year 2044 in Oklahoma City’s poverty-stricken trailer-home community known as “The Stacks” (trailers are literally stacked one on top of one another). In this future the world has been decimated by a slew of disasters – both technological and environmental – that have led society to basically give up and head to a new world. That new world is not Mars or another planet but rather the virtual-reality world of the Oasis. There people can be and do whatever they want through their avatars. The longer you are in the Oasis and building a coin count, the more cool things you can accumulate. And thanks to the creator of the Oasis, James Halliday (Mark Rylance), there’s also a whole slew of 1980s pop-culture references he loved as a kid (“You can even climb a mountain with Batman,” Wade says at the beginning of the movie). But there’s one more big reason to enter the Oasis. When Halliday died (before the events of the movie), he announced that he had left an Easter egg buried somewhere in the Oasis and that the first person to find it would receive a fortune and ownership of the Oasis. He also left three keys that lead to the Easter egg. But at the start of the movie, it’s been five years and no one has found any of the keys. During “Ready Player One,” we follow Wade and his friends as they try to find the keys. But they aren’t the only ones looking. The corporation IOI has a team of people working day and night to find the egg led by a former Halliday intern, Nolan Sorrento (Ben Mendelsohn). Spielberg still gives us his baseline theme that is in almost all of his movies: the main character’s troubled family life. But for the most part we are in the Oasis following Wade’s journey. 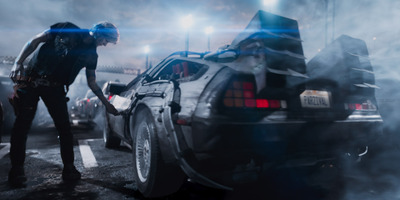 Things pick up when Wade discovers a cheat to the race he’s been trying to win with no success (driving the DeLorean from “Back to the Future,” Wade can never seem to get past King Kong to the finish line). With the victory, he becomes the first person to get the first key. A lot of that race is spoiled in the movie’s trailers, but it’s merely an appetizer for what’s to come. It’s when Wade goes after the second key that the movie kicks into another level. I’m not going to give it away. All I can say is that’s where the “ride” feel of a Spielberg movie kicked in for me. You could just feel the energy change in the theatre I was in when we all realised what was about to happen. And the movie just becomes more fun as it goes on. Along with the action, it sprinkles in a love story between Wade and Samantha (Olivia Cooke), and a race to beat Sorrento that juggles between reality and the Oasis. There’s also a great message about the need, as human beings, to have real-world interaction and not be plugged in all the time. Listen, I’m not trying to say we should put “Ready Player One” on the Mount Rushmore of Spielberg classic movies. What I hope I’m getting across is if you missed that Spielberg ride (or haven’t experienced it yet in your life), this movie is going to give it to you. 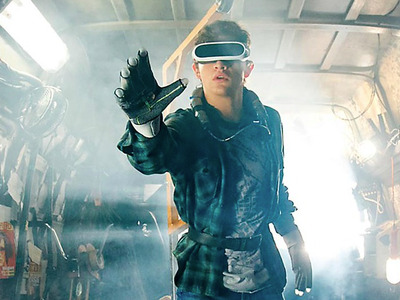 movies ready player one reviews sai steven spielberg thelife thewire-us warner bros.